Every now and then there comes a film that is critically acclaimed and it actually manages to live up to the expectations. As you know, The Movie Mind scoffs at the pundits and talking heads because they worry more about putting their seal of approval on a movie that is bound for the Oscars than a movie that might be bashed by their peers but is still entertaining. The King’s Speech manages to please us all. While a bit slow paced in the start, it still grips your attention and draws you in deeper and deeper to the characters and their struggles. Even though it turns out to be surprisingly funny at times, it is certainly not a film you can sleepwalk through. It does require your engagement for it to be truly enjoyed and appreciated, but you are more than rewarded in the end. The film tracks the British crown as it passes amongst the royal family, from King George V, to King Edward VIII, and finally to King George VI (the present Queen Elizabeth II’s father). Colin Firth plays King George VI (aka Bertie before he took the throne), an unusual leader who struggles with his lifelong stutter. Firth does an excellent job portraying a man who has all the makings of being a great leader, without the most glaring of all the necessary qualities for public office: being a strong and convincing speaker. With the radio becoming a more prominent vehicle for getting messages into people’s homes during that period, the odds were clearly stacked against a man who could barely get out two words without a long, awkward, pause. In a crucial time in history with Hitler in full-swing, England’s people were in dire need of a confident leader who could put them at ease. 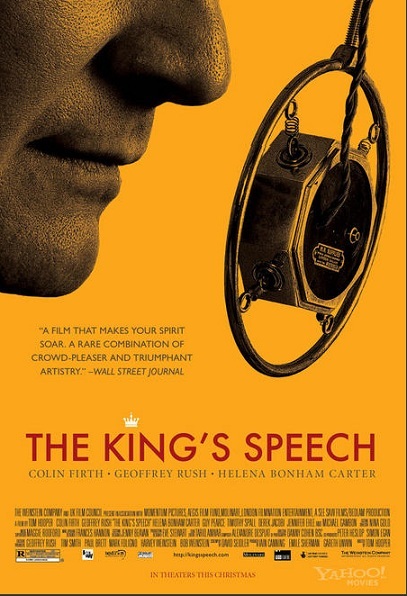 The film shows us how the future king’s budding relationship with a curt and controversial speech therapist (Geoffrey Rush) shapes his transformation into the leader he was destined to be. In my opinion, while Firth puts in a tremendous performance, Rush steals the show. His combination of humor, passion, and believability in the role make it difficult to take your eyes off him when he’s anywhere in the picture. I know this film is on the Oscars list for a number of nominations and they are all well-deserved. While I’m not ready to anoint it for “Best Picture” just yet, it does certainly belong in the conversation. Firth and Rush also deserve their nods for standout performances. All in all, it is one of the better all around films put together this year. A great story, excellent acting, and beautifully shot, it’s a recipe we don’t see in Hollywood nearly as often as we should. Interesting Cameo Appearance: Timothy Spall (a popular British character actor best known for his parts in the Harry Potter films and Sweeney Todd) as a young Winston Churchill, a friend and confidant of the king. King George VI: …Timing isn’t my strong suit. Lionel Logue: Please don’t do that. King George VI: If I am King, where is my power? Can I declare war? Form a government? Levy a tax? No! And yet I am the seat of all authority because they think that when I speak, I speak for them. King Edward VIII: Sorry, I’ve been terribly busy. Lionel Logue: How do you feel? King George VI: Full of hot air. Lionel Logue: Isn’t that what public speaking is all about?